I love a garden as much at night as I do during the day. When temperatures are extreme in the day, I prefer to be out in the garden at dusk. 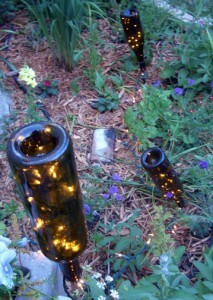 Taking some empty wine bottles and white Christmas lights, I made a new twinkling addition to my garden. This project also got me thinking how easy it would to make an outdoor chandelier with the same materials….ideas for a few more wine bottles down the road. Excellent idea! So simple yet so lovely. Thank you for sharing! How do you run the power to the lights? I luckily have a power outlet in the back yard. If you don’t happen to have one, there are plenty of options for solar powered xmas lights. They may be a little more expensive, but probably worth it! 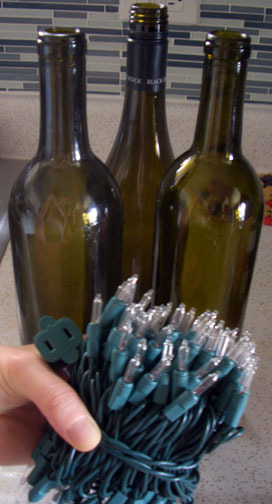 How did you get the lights from one bottle to the other? I am trying this. The lights go in good on the first bottle and then I leave some hidden in the ground to go the other bottle but I can’t get them in the 2nd bottle. It is a bit tricky. I used a plant stake to help push them into the bottle.